I watched Paranormal Activity & wanted to watch Paranormal Activity 2....and 3 & now wishing for a 4 too. Man, that's good stuff! 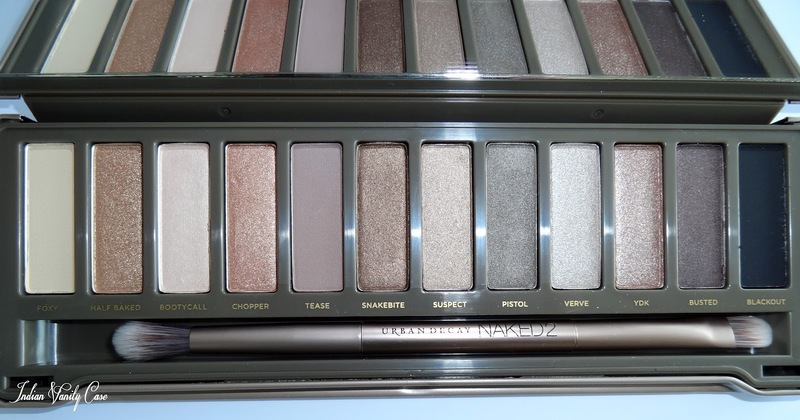 Same with Urban Decay NAKED, I had to see the sequel - NAKED 2. It's a Valentine's Day (Week?) present from Mr.CZ. God bless him & this day of... love (please excuse). I wouldn't have gotten it this soon otherwise, oh-no. Naked 2 comes with a dual-ended Good Karma Shadow/Crease Brush & 0.11 oz Lip Junkie Lipgloss in Naked (pinky neutral). Review & Swatches will be posted after I've used everything enough. Hope you enjoy the pics for now. Eyeshadows: Foxy, Half Baked, Bootycall, Chopper, Tease, Snakebite, Suspect, Pistol, Verve, YDK (What is this? 'You Don't Know'? ), Busted, Blackout. Shopandship.com! It's basically a courier company. You shop from websites in UK, US & China (that don't ship to India), get your purchase delivered to shopandship, and then they will deliver it to your address. So nice, right? Please visit the website to find out how to register & things like that. Shopandship shipping cost- Rs.1000 (they usually take Rs.600 for 1/2 kg), but Sephora packed the palette in a rather large box. Still worked out cheaper than Ebay at the time. Total Shipping Time: I got it in 2 weeks. Please Note: Some online websites don't ship to shopandship & other courier companies. I came to know about this method from my hubby, coz he gets video games and stuff. He learned about it from his brother. Closeted shopaholics they both are. P.S. This is based on my personal experience & I am happy with my first experience with Shop And Ship. Please use this info at your own discretion. I'm only telling you about another method to get what aren't available here. love the palette. i wish i could get my hands on it!!!!! oh I've been wanting naked2 for soooooo long!! btw your blog is amazing! I'm following! OMG this is totally amazing cynthia !!! ThAnk youuu!!! Isn't the Naked Palette gorgeous? It's probably one of the smartest and best beauty products out there. I must admit that I thoroughly enjoyed all the Paranormal Activity series. Very scary. Thank you so much for sharing this info with us! Wish you and your hubby a very happy valentine's day! ^_^. sry bt after listening to you i used shop and ship...BIG mistake!!! !dey took 45$ and didnt activate my account...im really angry!!! !